To have students "experience" what happens inside the body during every heartbeat. They will be able to explain the relationships between the lungs, the heart, the blood stream and the body. They also will understand the exchange of oxygen/carbon dioxide, as well as how tobacco and sugar effect the blood stream. Prior to this lesson, ensure students are familiar with the path of oxygenated/de-oxygenated blood in the body. 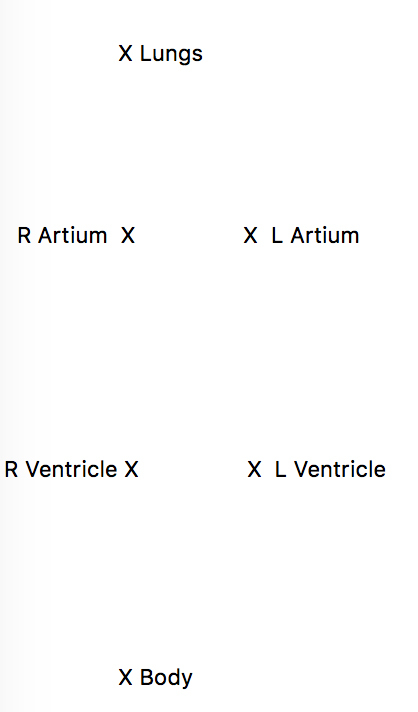 Ensure that they know blood goes from lungs -> L Artium -> L Ventricle -> Body (gets oxygen, gives off CO2) -> R Atrium -> R Ventricle -> Lungs. 6 signs (Labeled: Heart, Lungs, R Atrium, R Ventricle, L Atrium, L Ventricle, Body), cones, space (gym space works best), polyspots/markers, blue and red bean bags/small balls, Tennis balls, orange/yellow ball. 2. Choose 6 students to play a role of each part mentioned above. Give the LUNGS a RED ball/bean bag and the BODY a blue ball/beanbag. Demonstrate to rest of class the path of oxygenated/de-oxygenated blood by UNDERHAND tossing from lungs to L Atrium, L ventricle, Body, etc. ONCE the RED ball/bag gets to the BODY, have them exchange by placing the RED ball down and picking up a BLUE ball/bean bag (set next to them) to finish the cycle. The BLUE ball/bag should end at LUNGS. Debrief, ask students what lungs do with the BLUE blood (explain this is CO2). Answer: breathe out! 3. Now, mark spots in between each body part illustrating the path that that ball/bag took. Allow each student to have enough space to fill-in the gaps between each of these parts of circulation. They will act as "blood vessels" transporting the oxygenated/de-oxygenated blood. 4. Repeat the cycle with red/blue balls/bean bags. REMIND only to toss UNDERHAND! Allow 1-2 cycles of practice until students understand the path. Explain that this all happens in ONE heartbeat (could happen 60-100 or more times a minute). Challenge students to try once more as fast as possible. 6. Now, Tell students that this person just ate a chocolate bar! Explain how sugar is such a small molecule that it can quickly go to the bloodstream before it goes to the stomach! Give the BODY student an orange/yellow ball/bag and tell students that this ball will be tossed to EVERY OTHER blood vessel/body part to simulate how QUICKLY sugar moves through the blood stream. After 1-2 cycles of this, explain that this causes a sugar "rush" and sugar "crash". Remind students of course that sugar doesn't come in from the lungs but the stomach - which is why it starts at BODY. Explain that this person just smoked a cigarette! Introduce tennis balls at LUNGS and explain that these are to be ROLLED between each person. ALSO mention that when a red (oxygenated) ball/bag comes to a person, they must WAIT until the Tennis (Cigarette smoke) balls are one AHEAD of them. This simulates how Tobacco SLOWS down the circulation process and causes our' bodies to get oxygen at a slow pace (very dangerous!) Can also do the "drop your out!" version. After activities, ask students to explain to you what the blue/red simulated in the body system. Also can be adapted with MORE heart parts for HS and LESS for elementary! Ask students to illustrate the circulation path between the lungs and body. Submitted by Maxwell Frankel who teaches at Roberto Clemente Charter School in Allentown, PA. 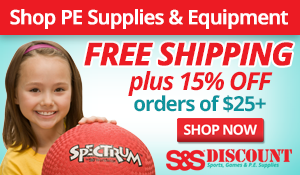 Thanks for contributing to PE Central! Posted on PEC: 1/4/2017. Viewed 51837 times since 10/27/2016. Wow guys this is wonderful and I love this session I hope everyone will love this more especially us who are beginners.